Have the requirements for being a good leader changed? 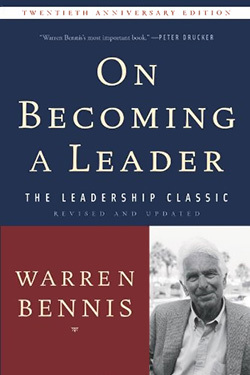 We continue our examination of the business book On Becoming A Leader with an interview of author Warren Bennis. What was the impetus for you to write On Becoming A Leader? I began writing it sometime in ’86. When I first moved to the University of Southern California in 1980, I thought I would do something substantial in leadership. That led to the book I did with Burt Nanus, Leaders. In some ways, things had changed when I finished Leaders in ’84. There were virtually no women in that book. In the top Fortune 500 there were only two women CEOs, Liz Claiborne and Kate Graham. And only 5% of the men I interviewed had working spouses. And that changed dramatically after Leaders. So I really had to crack that. And I do not recall in Leaders that there were any persons of color. For On Becoming A Leader, not only did I interview more women, I tried to get a much more diverse population. I wanted to get to the essence of what my writing was about. I wrote something like, “The process of becoming a leader is, if not identical, certainly similar to the process of becoming a fully integrated human being.” It’s got to do with authenticity, it’s got to do with candor, it’s got to do with the fact that one cannot truly lead unless one is an expert in self-management. The essence of leaders is placed firmly in issues of character, on who we are, on self-awareness. I thought I had to say some important things–I don’t think they are brand new ideas, but I had to frame them on the issue of the individual and through exemplary leaders. I had been criticized, and rightly so, for focusing not on the extremes and nuances, but on Rushmorian figures, more than the journeyman. It branded me. This is the book that keeps selling and other books like Geeks and Geezers, Organizing Genius, Still Surprised never did what I wanted them to do. I guess it’s because Becoming touches on most of the issues on the personal and character side of leadership. I think it has had a shelf life of 22 years is because of the distinction between managers and leaders, early on in the book. In some ways it impaired the reader with a slightly false dichotomy–I wouldn’t make that distinction today as sharp as I did then. And it’s a little bit of an evergreen book. If you think about great books, it lasts a couple of centuries. We are only talking about two decades here, but for a leadership book, it is a long time. With all the changes to the business world, have the requirements for a good leader changed? It’s changed enormously, the context. Context will determine the strategies, the knowledge base. I have taught a course at USC, it will be our 15th year coming up, and I’ve taught it with the President of the university. It’s called “The Art and Adventure of Leadership.” The course has really focused on character and personal dispositions: be, know, and do–character, knowledge, and action. Those are the things that have been dominant in the course and the book. My book Geeks and Geezers came out in ’02. That book was at the dawn of the Internet. When you think about the year On Becoming A Leader was published, 1989, two major events occurred: the Berlin wall was torn down and the actual introduction of the Internet. There were only 400 users on the Internet in 1989. When Geeks and Geezers came out, it was trying to look at the differences in generations. Now that book is outdated–even though it wasn’t dumb about the significance of the Internet, but we are in a totally different universe now. And globalization is a cliché now. The challenge for leadership, while at the character level hasn’t changed so much, but the cognitive level and complexity level have. Do you remember EB White, who wrote Charlotte’s Web? He wrote an essay in the New Yorker years ago, called “There’s a Bright Future for Complexity.” The way it ends is, “There’s a bright future for complexity, with one thing always leading to another.” It’s not just the Internet, it’s connectivity. I am going to predict that in the future the hot degree ten years from now will not be the MBA, it will be something like Master of Communication Arts or Connectivity Arts. Without understanding connectivity, the basis of human connections, network theory, contextual intelligence, any business leader unable to grasp those things will be lost. In 1963, I coauthored an article with a brilliant sociologist from Harvard named Phillip Slater. We’re still good friends. It was called “Democracy Is Inevitable.” We sent it to The New York Times Magazine and we got back a letter saying, “We don’t have the space for your paper because we published a paper on democracy three weeks ago.” As if they had Democracy covered for another year. So we sent it to Harvard Business Review, and they retitled it, “Is Democracy Inevitable?” So my next book will be called Democracy Is Inevitable. I am really going way out on this one. This gets away from focusing on character–which is still important and I am not taking anything back from On Becoming A Leader at all. But there are things happening in the world, like the Arab Spring. If you look at all of the social sciences, the area that is weakest is the area of development. In 1951, at MIT, Paul Samuelson flippantly said, “Economic development as a sub-area of economic theory is a wasteland.” That stuck in my mind. My book that I am working feverishly on is about how is it that countries gravitate toward a democratic form of government–which does not mean U.S.-style necessarily. It’s a huge work and I am going to put myself out on a limb. I have never felt this passionate about anything I’ve done–and I’ve never felt less certain that I can pull it off. Let me put it to you in a nutshell. Our planet will evolve in the next 25 years or so into about 25 to 30 major urban centers that while located in various nations, will become the nerve centers and destinations of global commerce, communication, business, political, educational, and media institutions: L.A., Singapore, Shanghai, Mumbai, Tokyo, New York City, SF, Seattle, Vancouver–others more expert than I can nominate others. In a recent McKinsey Global Institute report, called “Urban World: Mapping the Economic Power of Cities,” it read, “Nine out of the ten urban areas that will experience the highest GDP growth from 2007 to 2025 are in China. Out of the top 25 growth cities, 21 are in the developing world, including 5 in China.” What I am trying to get at this book is how we transition to a more civil society. This means learning and understanding the ecology of urbanization. The McKinsey report ends with this amazing statement, “This urbanization is lifting more people out of poverty than any movement in history.” They listed 25 cities that they see, and only New York, London, L.A., and Tokyo will outgrow places in China. Leaders have to learn how they are going to deal with a different world, where national boundaries fade. The next step in MBA education is not globalization, but urbanization. This is going to be a major part of the book. It’s not an original idea alone. I think what’s important is to frame the book. Take Malcolm Gladwell. As much as he is criticized by my fellow academics, and as much as I criticized him, I think he is a brilliant exemplar of best selling business books. I have principled envy toward the guy. What he does so beautifully is he manages to locate somewhere in our brain a topic, a thought, that we were always curious about. It’s how he took it, framed it, and went in to great detail: part I of Tipping Point is marvelous, part II is sort of marvelous, and part III is shallow. He takes an idea in the air, so speak, and addresses it. He also happens to be a good writer. Gladwell is the model. Look at Freakonomics, it’s the same model: vivid examples, interesting examples we’ve all thought about. Tom Peters didn’t say anything especially new, but he reframed it. Take Covey, take Blanchard, take Spencer Johnson, take people that have written bestsellers that come out of consulting practices rather than academics, like Ram Charan. In all cases they have a burning platform and drew lessons from vivid examples. It’s a Gladwellian way of framing it that makes it a good business book. I start my lectures quoting Shakespeare. I think Henry IV, Part I is the best book on leadership I have ever read. James Burns’s book Leadership is in my canon. Tom Peters’s work overall. There’s a book on Gandhi by Erik Erikson called Gandhi’s Truth that I would put up there. I would say Howard Gardner, his book Leading Minds specifically–it’s very key in my thinking. I would also mention Gardner’s Responsibility at Work, and his book with Mihaly Csikszentmihalyi and William Damon, called Good Work. I think that is under-acknowledged. I would also say Garry Wills–his book Certain Trumpets is first rate. David Brooks’s book Social Animal is first rate–that is a relatively new one. There is one other book I would mention, that is David Gergen’s Eyewitness to Power. I am nervous that I am leaving out some that I should’ve thought of. I am sure by doing this I am making a lot of enemies. Read more from On Becoming A Leader or our Leadership Hall of Fame. 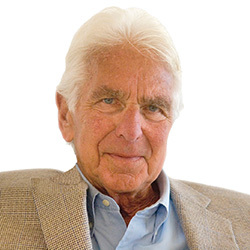 Warren Bennis is the author of the book On Becoming A Leader: Twentieth Anniversary Edition.